Breeder of winning merle genetic pattern Chihuahuas provides photos, defends genetics, and thanks Gladstone for his letter to CCA members. Editors Note * I would like to present a view from someone who is breeding the merle genetic pattern and directly affected by the anti merle activists in their campaign to have the merle pattern disqualified (from the show ring) within the standard of the Chihuahua breed. I believe a public ''thank you'' is in order for Mr. Gladstone. I have been raising and showing dogs since 1969. During this time period I have accumulated well over 100 breed titles and 30 plus obedience titles. I have been breeding and showing Chihuahuas since 1988 and have many [50 plus] champion titles on the Chihuahuas I have bred, including the #2 Smooth in 1999. Genetics was one of my main courses in college. I searched far and wide and to obtain my merle foundation Chihuahua stud, who has been DNA tested “pure”, meaning no other breed is found in his genetic make-up. He has produced 3 champions to date. Information being circulated by the anti-merle activists is either outdated or has been totally fabricated. To my knowledge, no merle breeder, including myself, has had a CERF or BAER test on any Merle come back anything but normal. Non-visible and visible merle Chihuahuas have been around for a great many years, but were ''culled'' or sold to pet homes. Now there are many titled, visible and non-visible merle patterned Chihuahuas due to ongoing breeding education, genetic science and the furthering of genetic studies, and the beneficial use of DNA testing. As it stands now, there are a few very ''verbal activists'' that have caused mass hysteria within the breed as a result of the fabrications, distorted viewpoints on the history of the Chihuahua breed, sensationalism and scare tactics. Merle breeders have a lot of time and money invested in their show and breeding dogs. If the merle pattern disqualification is voted in AKC allows the disqualification to stand, there are those that are prepared to seek compensation from both. Many of us [all merle owners] were denied membership to the CCA, thus we are not able to vote on a very crucial breed change. You may not have Chihuahuas, or even a breed that carries the merle gene, which in many breeds is perfectly okay, but you have dogs, and you register with AKC, so you should explore all of the genetic (and political) ramifications of an AKC Director interfering with a parent club ballot. It is okay to come, indefensible to others. It should be noted that Mr. Gladstone is also a director for the Canine Health Foundation so the letter Steve Gladstone, Esq. sent on AKC letterhead carries a double blow. AKC's defense of that Director's action, a letter from the British Chihuahua club, a personal letter to Gladstone from an Australian club secretary, and finally, a rebuttal on the merle risks in the Chihuahua breed are in many ways, applicable to several breeds, including the Corgi, which Steve Gladstone breeds. 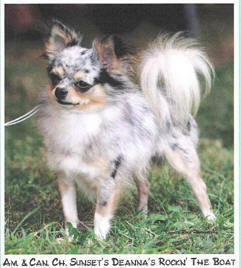 AKC Defended Board Member who interfered with Chihuahua Club ballot on merle color DQ. AKC communications with Gloria Lambert, internationally respected Chihuahua breeder. Gladstone Letter to CCA Members See the letter by Steven Gladstone, who interfered with Chihuahua Club Of America ballot to DQ merle color, using his AKC and AKC/CHF Board positions. Chihuahua Breeder Rebuts disqualifying merle colored, defends genetics, breeds, shows, and wins with the color and thanks Gladstone for his letter to Chihuahua Club Of America members. 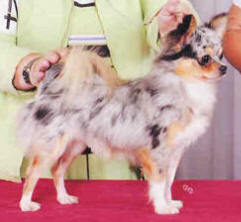 World Bans Merle Chihuahuas but CCA voted down merle DQ following ballot interference by AKC Board member. Other countries refuse to register any dog out of merle parents. American Breeders unable to export.